Public Health Engineering & Water Supply (PHED & WS) department of Arunachal Pradesh gets Rs 8.71 crore additional fund from Central Government. This was informed by the Union Minister of State for Drinking Water & Sanitation, Ram Kripal Yadav in his meeting with the Chief Minister, Minister and Parliamentary Secretary of PHED & WS at Chief Minister’s Office yesterday evening. The minister is on a one day visit to the state to take stock of the implementation of Drinking Water and Sanitation programme in the state. The Union Minister reiterated that Prime Minister, Narendra Modi is giving special emphasis to the North East and the central govt is very keen towards the development of the region, particularly the border state of Arunachal with special focus on its international border. He informed that north east is getting the highest allocation of fund in the recent fund distribution among the states in the country. 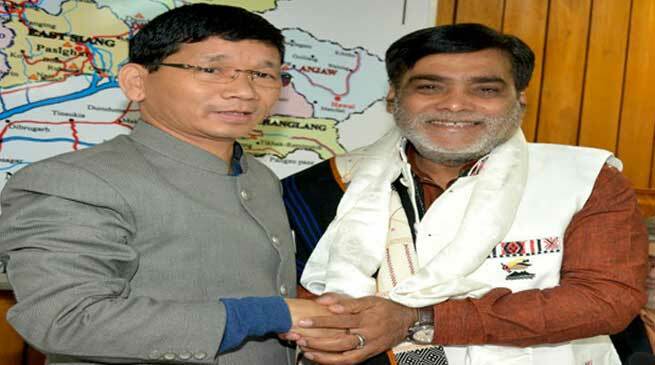 Yadav appealed the state government to make Arunachal an Open Defecation free by 2019, before the national target of 2022. He also appealed the state to emulate small state like Sikkim which has become an open defecation free state, urging to focus more on remote and interior areas. Satisfied with the achievement made by the state government in Drinking Water & Sanitation, he assured all possible support and help from the union government in the developmental arena of the state and asked the state government to send proposals including for the pending ones. The union minister called to put emphasis on water supply connection along with the Sanitation saying that without water supply, sanitation is incomplete. He lauded the efforts of the state govt for putting a huge target of 40,000 Individual Household Latrine (IHHL) in the state budget 2016-17 and assured to extend all possible support from the centre. He also appreciated the way IHHL are being implemented in the state. Urging the department to take up the toilet construction in schools under the CSR schemes of the PSUs operating in the state, the union minster informed that Prime Minister has given directives to all the PSUs to invest in sanitation. The minister expressed his happiness for the love and affection shown by the people of the state. Chief Minister Kalikho Pul while highlighting the border sensitiveness of the state and its difficult terrain pressed for enhancement of fund from the existing Rs 12000 to Rs 40,000/- per unit in IHHL. He informed the cost of construction materials are very high in the state owing to difficult terrains and high cost of transportation. He pressed for modification of the present half concrete structure to a full concrete structure for longer durability and also to provide fund for a complete set of toilet with attached bathroom.